Figure A27. Central China anomaly, interpreted as the Central China slab, with (horizontal) [vertical] cross sections through (A)[D] the UUP07 p-wave) and (B)[D] the combined SL2013 and S40RTS s-wave models at 2150 km; C) the location of the modern geological record that we interpret to have formed during the subduction of the slab. 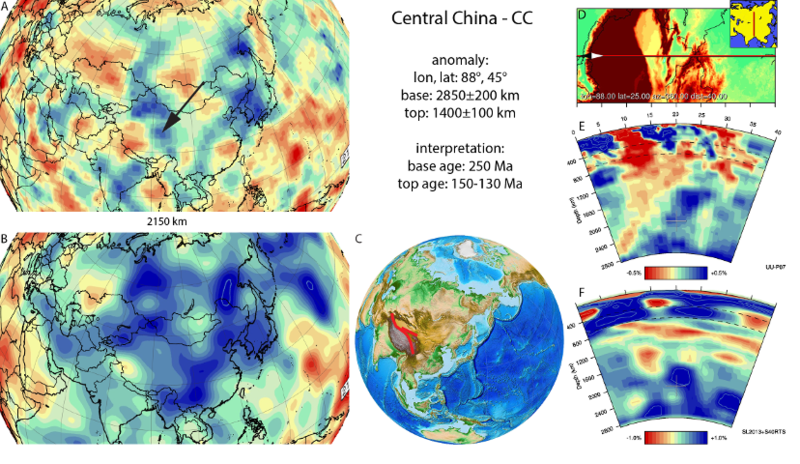 The Central China anomaly (Figure A27) is located in the lower mantle from the core-mantle boundary upwards to a depth of ~1500 km. It was first defined by van der Meer et al. (2010), who separated the slab from the Mongol-Kazakh slab as defined by Van der Voo et al. (1999a). Van der Meer et al. (2010) interpreted the Central China slab as representing Paleotethyan lithosphere that subducted between North China, northeast Tibet and Eurasia following interpretations of Stampfli and Borel (2004), assigning a Permian to Early Cretaceous age to this slab. Recently, however, Van der Voo et al. (2015) proposed that the Mongol-Okhotsk subduction zone started as a westward dipping subduction zone below Siberia in the north and Amuria in the south, whereby the northern, currently WNE-WSW trending margin of Amuria along the Mongol-Okhotsk suture was oriented N-S until Triassic time and rotated counterclockwise towards its current orientation throughout the Late Triassic and Jurassic, culminating in an orocline around the western termination of the Mongol-Okhotsk suture in western Mongolia. In that interpretation, the Central China slab subducted since at least Triassic times until the latest Jurassic below Amuria, and form the southward continuation of the Mongol-Kazakh slab. The paleomagnetic data summarized in Van der Voo et al. (2015) in addition imply that the North China block moved 1000’s of km northward relative to Siberia-Kazakhstan until the latest Jurassic-earliest Cretaceous, requiring that the North China-Kazakhstan plate boundary should accommodate significant (oblique) convergence. Although the location of such a plate boundary remains enigmatic, a ‘Paleotethyan’ origin as implied in Stampfli and Borel (2004) is not excluded. If related to the advance of NE Tibet to Eurasia, the Central China slab subducted since at least Triassic and probably earlier time, and ended around the Jurassic-Cretaceous boundary 140±10 Ma. An alternative interpretation would be that the Central China slab resulted from subduction along the Songpan Ganzi suture between the Qiangtang and Kunlun terranes. This subduction also started prior to the Triassic, and ended in Late Triassic or Early Jurassic time, ~200 Ma ago (e.g., Pullen and Kapp, 2014). In the recent reconstruction of Van der Voo et al. (2015) the reconstructed position of the Songpan-Ganzi suture would however be ~15° south of the slab and is therefore considered an unlikely candidate associated with the subduction of the slab.